Over the past years, we have seen a host of hype words appear: Agile, Scrum, Big Data, BYOD, Lean IT. “DevOps” is probably one of the most enigmatic of them all. This word is used more and more often without it really being clear what it means. 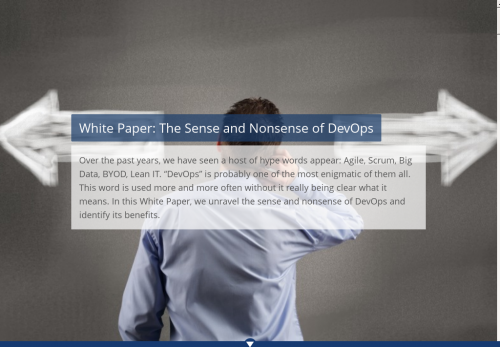 In this White Paper, we unravel the sense and nonsense of DevOps and identify its benefits. The term DevOps emerged in a series of “DevOps Days” held in Belgium about five years ago. The aim of the events was to bring together IT experts from both the development side and the operations side of organizations. And that puts the term DevOps in its context: a multidisciplinary team that is fully responsible for the continuous operation and development of a service. Google and Amazon are examples of companies that use a combination of DevOps and continuous delivery to release dozens of changes every day. The definition of DevOps on Wikipedia is interesting: DevOps (a portmanteau of development and operations) is a software development method that stresses communication, collaboration and integration between software developers and information technology (IT) operations professionals. DevOps is a response to the interdependence of software development and IT operations. It aims to help an organization rapidly produce software products and services. The key point here is that, in this definition, DevOps is about producing software rapidly. This completely ignores the real value and aim of DevOps. What is the real value of DevOps achievable with a DevOps approach used to its full extent? Is it a culture? Is it a job title? Is it a way of organizing? Or just a way of thinking? Well, there are several opinions, but before we address the “what”, let’s address the “why”. The rise of cloud-based web applications is putting IT under pressure. The IT user community is demanding quick releases in response to issues or requests and this often results in more defects in operations due to poor development quality. IT cannot afford to lose out; it must respond rapidly and, at the same time, innovate and reduce operational costs. This is also true for daily change. The common challenge of many IT organizations is: how can IT cope with the changing demand for IT services? Change is the new Run while staying in control of delivering IT services to production. What is the Software Defined Data Center? The software-defined data center (SDDC) is a radical paradigm shift that transforms the traditionally infrastructure-centric data center, with its focus on ensuring the proper operation of computing, networking and storage elements, into an application or business-service focused environment. The software-defined data center revolves purely around application workload demands, allowing business users to deploy and run their applications in the most efficient and SLA-compliant manner. Broadly speaking, up until now, various experts have looked at DevOps from three dimensions: tools, processes and culture. The natural reflex in the world of IT is to use technology to resolve a problem. In itself, this is a sound approach, especially if changes can be deployed to production more often and more reliably. By using integrated tooling to strictly manage the movement of units of work through a DTAP (Development, Testing, Acceptance and Production) flow, release frequency can be accelerated to a level that could never be achieved manually. Tooling is therefore an indispensable element of DevOps. In practice, what people think of DevOps is shown to be highly dependent on the experience they have with it within their own organization. In this paper, we use four DevOps journeys to bring together these different experiences as pieces of a larger puzzle. Each journey describes the development of DevOps from a particular perspective. Each of the four journeys can be regarded as the archetype of a journey an organization can make. These journeys serve as a frame of reference for discussions about the meaning of organizational changes. In practice, you have probably noticed that within the various parts of your organization people are trying to find a solution to the increasing need for agile and reliable IT. Each part does so from its own perspective. However, this is like trying to convey what an elephant looks like by only describing its trunk or its tail or foot. Each part of the organization is right, to a certain extent. The trick is to make combinations of descriptions which provide a clear picture of an elephant. By understanding the different perspectives, you can combine them powerfully because the underlying goal is a common one. A significant number of DevOps researchers see realizing a common culture between Dev and Ops people as the vital element. This involves building understanding between developers and ‘operations people’, and ensuring more collaboration between the two camps. For the IT world, this is not an everyday approach. Relevant arguments can be put in favor of each of the dimensions mentioned above. Nonetheless, in practice, it turns out that DevOps people often choose one of the dimensions above the others. This is a shame because the strength of DevOps actually lies in combining these dimensions, and adding two others. To the above three dimensions, we add performance (which in some cases is included as a component of processes) and organization. Moreover, it has been shown that culture is a difficult dimension to manage. In its place, the ‘Attitude and Behavior’ dimension is much more closely aligned with the aspects that are important in DevOps. We argue here for these five dimensions to be treated as equal and to use them all to design the integration of ‘Dev’ and ‘Ops’. It is important to recognize – especially at the start of the integration – that the behavior of developers and operations people is different. Harmonizing attitude and behavior is important in making DevOps a success. Of course, creating mutual understanding is a crucial element. By focusing on behavior instead of on culture, we ensure that the members of a DevOps team become aware of their own role in the success of their team. How managers provide guidance, in relation to the maturity of the team and the extent of the integration, is also a decisive factor in the success of DevOps teams. DevOps promises a lot in terms of more, faster and better releases. As a result, in the DevOps world, there is a strong trend towards focusing on making IT performance measurable. This is giving some people pause for thought. There is indeed nothing wrong with an end-to-end approach to the delivery of IT services to customers. However, is it important to know exactly how many hours are needed to build a use case? Especially given that DevOps was developed to meet customer demand. Another aspect of performance is the use of time: how is time used within the team? What is the balance between innovation and maintenance? The outcome should be the implementation of actions for improvement aimed at redressing the balance in favor of innovation without compromising quality. This journey starts from application manage¬ment. In this domain, staff members are mainly organized in silos according to their expertise. This means that service delivery managers, functional application managers, technical appli¬cation managers and database managers make up separate departments or teams. Processes are focused on channeling the work through the different teams. To facilitate this, ITIL process managers and ITIL coordinators are added to the organization as a function. One of the least discussed aspects of DevOps is the organizational dimension. This revolves around adapting the IT organization to bring ‘Dev’ and ‘Ops’ closer together. In practice, however, it turns out that people primarily work on improving the communication between ‘Dev’ and ‘Ops’ rather than on implementing organizational changes. In addition, the management model and the skills of managers turn out to be crucial to the success of a DevOps team. Various approaches, including Lean, offer a wide array of tools (e.g. Visual Management) for efficient management and tackling problems. In practice, it is now common for operational inventory to be ‘visually’ managed within a Dev organization. However, managing activities via Kanban boards (visual displays of the operational flow) is often uncomfortable for ‘Ops’ people. Experience has shown that this discomfort disappears relatively quickly. The most important aspect of the organizational dimension is paying attention to team-forming. Putting people together works to a certain extent, but to gain more benefit, attention should be paid to team-building. As mentioned earlier, the processes within an IT organization are usually not clear to the staff. This is because the process flow is comprised of a series of departments which are all only involved in part of the flow. Staff are thus unclear as to what their role is in the chain as a whole. In a DevOps team that works with Visual Management, it is possible to optimize processes without involving the departments concerned. This means that complex manuals make way for simple, clear agreements. It turns out that within processes, the key to success is the strict monitoring and management of open units of work. The third DevOps journey described in this paper is relatively unknown within the domain of DevOps, but it is essential to facilitating the journeys set out above. The starting point of this journey is the infrastructure management domain (from running infra via changing infra to providing self-service infra). Infrastructure as code and platform as code are terms you will hear in this regard. Making virtual infrastructure provisioning available to the DevOps teams allows them to respond flexibly to their changing needs for suitable infrastructure. Within a DevOps team, a fully automated DTAP flow is a prerequisite for guaranteeing speed and quality. Does this mean that a DevOps team cannot exist without this tooling? No, the increasing automation of the various steps through the DTAP flow is also a growth scenario. There are also many benefits to be gained through growth in one or more of the other dimensions. The aforementioned five dimensions all play a role in an approach based on DevOps methodology and in realizing the intended benefits. Ultimately, DevOps is about providing permanent IT services for customers. Over the past years, it has been clear to see that IT organizations are focusing more on the needs of their customers. Information management was a start, the introduction of Agile-like methods was a second step. But these methods are only partial solutions to a fundamental problem in IT: sticking to a traditional organizational form in which we arrange things on a type-with-type basis. Working with a DevOps approach breaks down the traditional organizational structure of IT departments. However, in order to make DevOps a success, it must be clear who the customer is and what services customers want to have delivered. This requires thorough analysis and clear definitions of both ‘customer’ and ‘service to be delivered’. Identifying a customer or customer group makes it much simpler to determine the value that should be delivered. Based on these basic characteristics, the technology stack for which the team is responsible can be determined. The ‘deeper’ the technology stack, the more knowledge and skills the team requires. In this regard, the rise of cloud technology with its different variants (IaaS, PaaS, SaaS) does make it easier to decouple the team from the underlying technology (Figure 1). In practice, we regularly see DevOps being integrally linked to Agile/Scrum. It is definitely true that these methods offer the DevOps team a number of useful insights. Especially time-boxing and the use of a product backlog can be handy. But these methods are not necessary prerequisites for a DevOps team to function. What service is to be delivered? What are the units of work the team will be processing? What is the ‘definition of done’ for these units of work? That brings us to the fourth DevOps journey. A next step is taken in this journey. The DevOps teams seek to respond to the application do¬main’s need to reduce time to market. Infra¬structure facilitates these teams optimally with appropriately modified platform and infrastructure services. As the quality is demonstrably under control, the added value of the division between run and change becomes steadily lower and new possibilities are created for further expanding the change domain. After all, the continuity of service delivery is safeguarded. The real strength of DevOps comes from the psychological impact of the creation of a team that has both the capability and the mandate to fully serve its customers. The rules for working as a team apply fully to a DevOps team, including having a shared goal to be achieved by people with complementary skills, who hold themselves mutually responsible for achieving the goal. In this way, an opportunity is created to establish a high-performing team that adds significant value to the business process. It is important to emphasize here that a DevOps team is something different to what we traditionally refer to as a ‘team’, for example a database team. A team like a database team, is not a team in the official sense of the word due to the absence of complementary skills. From the perspective of time saving, simplified processes and agreements require far less coordination because the vast majority of units of work are dealt with within the team. This saves an enormous amount of time compared to a situation in which an incident is passed back and forth between three departments, each of which puts its own interests first. Another advantage of DevOps is that people have better insight into costs. Since all costs are related to the team, it is much simpler to determine the cost of ownership for the support of a customer or customer group. After all, what is involved are the salary costs of the team and the costs of the technology stack. It becomes much simpler to determine the value of a team given that personnel costs represent hours of knowledge purchased. By linking the hours to the business value of the service provided, the costs of the team in relation to the value delivered can be calculated quickly. As mentioned earlier, not all aspects of DevOps need to be implemented fully, or to the same extent, in order to realize the benefits of DevOps. The DevOps Integration Model (Figure 2) provides a frame of reference that indicates the aspects to which attention should be paid. Defining what is meant by ‘customer’ and ‘service’ is critical, as already stated. We also see that working on customer orientation within the team is another important element. In addition, we find that measuring and managing performance regarding smaller units of work (incidents, service requests and standard changes) is essential. The greatest effects are achieved by paying attention to attitude and behavior, particularly by providing a secure environment within which Dev and Ops people share their experiences. The role of the team leader in initiating actions aimed at team forming, contributes to this security. The last basic prerequisite for being able to start DevOps is the availability of both development and service management tooling. These are the starting points for every IT organization that wants to develop into a DevOps team. An interesting aspect of DevOps teams is that they aim to become independent of other teams, i.e. to realize overall responsibility for the service provided to the customer without having to resort to other teams, which could result in delays. Naturally, this aim has boundaries. Full independence actually means that a DevOps team becomes a mini IT organization. If this is taken too far, economies of scale could be lost. Is DevOps for everyone? This question is more difficult to answer than it seems. It has to do with the size of the IT organization in relation to the diversity of the services it delivers. The key test criterion is: can we use shared resources optimally? If setting up DevOps teams leads to a situation in which a relatively large number of people have to divide their time between various teams, DevOps is probably not the solution to the IT organization’s problems. However, this does not mean that closer collaboration between Dev and Ops should not be pursued. Smaller organizations (fewer than fifty people) usually have three departments (Service Desk, Infrastructure and Applications). For such organizations, integrated teams are important if IT services are to work well. This requires integration of tooling, team forming, designing short processes with sound agreements, clear and simple KPIs, and creating mutual understanding between the various departments. For these organizations, the criteria for integration are actually of substantial value. As stated in the introduction, DevOps is a hype. The obvious question is: what comes next? And can’t we simply skip DevOps in anticipation of the next big thing? My judgment is that for many organizations, DevOps can mean making a break with the past. By forming teams that can actually operate perfectly well on their own, dismantling IT organizations becomes a realistic option. In this scenario, a DevOps team would be added to the business department it supports. Of course, a relationship with an internal data centre (that acts more and more as a cloud service provider) could continue to exist, but this is not obligatory as these services could easily be purchased from outside. Taking everything into account, DevOps is a highly desirable development with the potential to change the world of IT dramatically. DevOps has the potential to add more value to the business processes of its customers. To capitalize on this, IT managers must be prepared to challenge their current organizational form, even if it means their ‘empire’ becomes smaller. view of DevOps also warrants a new definition: DevOps (a portmanteau of development and operations) is an organizational philosophy that stresses communication, collaboration and integration between information technology (IT) software developers and IT operations professionals. DevOps uses the interdependence of software development and IT operations to create higher quality products and services. Its aim is to help organizations rapidly deliver the value sought by IT customers. Niels Loader (n.loader@quintgroup.com) is a Principal Consultant with Quint, and one of the leading experts on Lean IT. He is the Content Board Lead with the Lean IT Association (LITA) and is Chief Examiner of Lean IT with APMG. Niels brings extensive experience in the areas of IT Service Management, IT Performance Improvement, Lean IT and DevOps. Niels Loader (n.loader@quintgroup.com) is a Principal Consultant with Quint. He is the Content Board Lead with the Lean IT Association (LITA) and is Chief Examiner of Lean IT with APMG. Niels brings extensive experience in the areas of IT Service Management, IT Performance Improvement, Lean IT and DevOps.